The wedding took place yesterday of the very lovely Miss Emma Joy, daughter of Mrs Maureen and Mr Anthony Joy, to Mr David Cagney, son of Mrs Helen and Mr Maurice Cagney. The marriage took place in the Church of St.Thomas The Apostle, here in the village of Rosegreen, Co.Tipperary, with the ceremony beautifully conducted by Rev. Fr. Thomas Hearne, latter a close friend of the Bride and Groom. 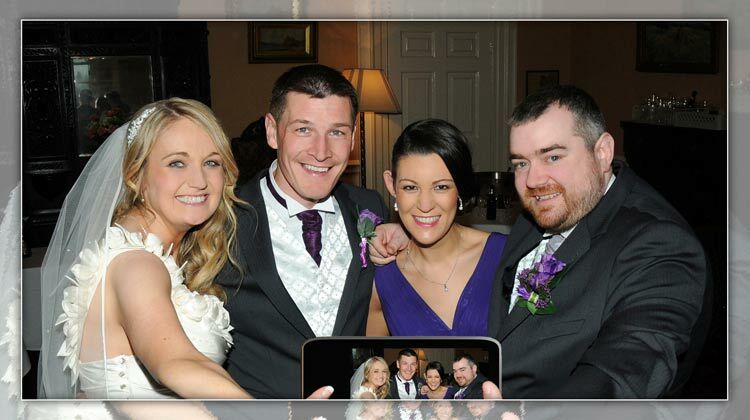 Emma & David share a “Selfie” by phone to celebrate their wedding at Dundrum House Hotel yesterday. Escorted down the aisle by her father Anthony, the bride looked stunningly beautiful; wearing a bespoke, one shoulder, ivory afternoon wedding gown, with sweetheart neckline. Same was highlighted by matching flower detail in relief and beautifully foiled by a one-tier chapel bridal veil. Equally beautiful were her four accompanying bridesmaids; Cathy Day (Maid of Honour), Louise Joy, Christina Ryan and Helena Cagney, all who wore full-length, purple, V-necked evening gowns with fine pleated bodices and delicately embellished diamonte waist bands. The groom, David, together with his best man, Kevin Ryan and groomsmen, Paul Cagney, Allan Devitt and Alan Pyke, all looked dashing in dark evening suits, elegantly highlighted by white ‘Oxford Plain’ shirts with white / silvery waistcoats and grey and purple matching silk cravats. The couple proclaimed their love for each other in front of a large gathering of family members and close friends, with music provided for the ceremony by guitarist Mr Dom Driscoll and with vocals provided by Mrs Maureen Joy and Mrs Anne Rhatigan. Scripture readings were undertaken by Maureen O’Dwyer, Maureen B. O’Donoghue and Denise Boyle, while prayers of the faithful were read by Kelley Lee, Caroline Cagney, Avril Rhatigan, John O’ Donoghue and Denise Boyle. The Offertory Procession of bread & wine were carried to the alter by Mrs Maureen Joy and Mrs Helen Cagney, latter mothers of the newly married couple. The customary wedding day ‘Communion Reflection,’ entitled ‘The Dance,’ was sung by Mrs Maureen Joy, mother of the bride. Following a very beautiful and relaxed ceremony, the new Mr and Mrs Cagney retired to the ever popular local wedding venue, Dundrum House Hotel & Golf Resort, Dundrum, Thurles, Co Tipperary, where guests were entertained to a Champagne and Wine reception, together with many other light refreshments. Following family photographs in the wedding complex, the newly married couple joined their guests in the hotels main Ballroom for dinner, which was followed by dancing very late into the evening. The couple have chosen to keep secret, for the moment at least, their favoured honeymoon destination. To Emma and David, go all best wishes for a happy, healthy and prosperous life together and this wish comes from all your family, friends and well wishers here in Co Tipperary and indeed further afield. Fab photo, we had a ball everything was perfect. Hi Anne, A most relaxed and enjoyable event. One I am sure they will remember for many many years to come. Even the rain went unnoticed.